Eugene Asa Nils Carr was the oldest of four sons born to Clark Merwin and Delia Ann (Torry) Carr on March 10, 1830 in Hamburg, New York. He graduated from the United States Military Academy at West Point in 1850, 19th in a class of 44 cadets. He was appointed a brevet 2nd Lieutenant in the Regiment of Mounted Riflemen, and served in the Indian Wars until 1861, seeing his 1st combat in October, 1854 against Apaches near the Sierra Diablo Mountains. By 1861 he had been promoted to Captain (June 1858) in the old 1st U.S. Cavalry (later designated the 4th U.S.) and to command of Fort Washita in the Indian Territory. During the Civil War, Carr's first combat was at the Battle of Wilson's Creek in August, 1861. He was appointed colonel of the 3rd Illinois Cavalry six days later and received a brevet promotion to Lieutenant Colonel in the regular army. At the Battle of Pea Ridge in Arkansas, in March, 1862, Carr led the 4th Division of the Army of the Southwest in the fighting around Elkhorn Tavern. He was wounded in the neck, arm and ankle and was later awarded the Medal of Honor for conspicuous gallantry in that action. According to the official citation, Carr had "directed the deployment of his command and held his ground, under a brisk fire of shot and shell in which he was several times wounded." On April 30, 1862, President Abraham Lincoln appointed Carr Brigadier General of Volunteers, to rank from March, 1862. 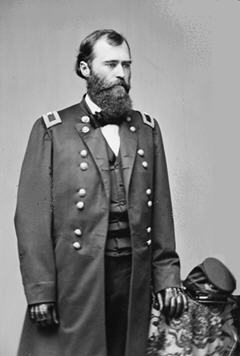 Carr briefly commanded the Army of the Southwest from October 7 to November 12, 1863. He commanded the 2nd Division of the Army of Southeast Missouri before he and his division were transferred to the Army of the Tennessee as the 14th Division in the XIII Corps. During the Vicksburg Campaign, Carr led the attack on Confederate forces at the Battle of Port Gibson. He fought in subsequent battles at Champions Hill and Vicksburg. After the fall of Vicksburg, Carr was transferred back to Arkansas where he was placed in command of a division in the Army of Arkansas. Eventually Carr commanded the Cavalry Division in the VII Corps during Frederick Steele's Camden Expedition. For the rest of 1864 he commanded the District of Little Rock. His final assignment of the war was to command of the 3rd Division of the XVI Corps in preparation for the Union campaign against Mobile, Alabama, where he subsequently fought in the Battle of Fort Blakely. On March 11, 1865, President Lincoln nominated and the U.S. Senate confirmed Carr for appointment to the brevet grade of Major General of Volunteers. He was mustered out of the volunteers in January of 1866. In July of 1866, President Andrew Johnson nominated Carr for appointment to the brevet grade of Major General, USA (regular army), to rank from March 13, 1865, and the U.S. Senate subsequently confirmed that appointment. 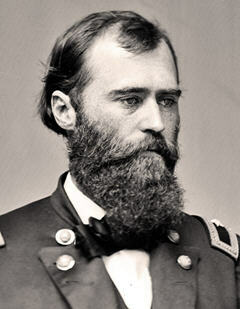 After the war, General Carr conducted many successful operations on the frontier against the Indians, winning a significant battle at Summit and became colonel in the regular army in 1879 6th Cavalry, and brigadier general in 1892. He was in command at the incident at Cibique Creek with the Apaches. His military nickname was "The Black-Bearded Cossack", and his exploits as an experienced Indian fighter on the frontier are the stuff of legend. After 43 years of distinguished service in the military, he retired in 1893 at the rank of Brigadier General. I am a born historian with a doctorate in history and a masters in museum studies, history and public administration, and a member of SUVCW William McKinley Camp #21. I served from 1958-1999 in the U. S. Army from private E-1 to LTC 0-5. My love of the military and the Civil War guided my educational aspirations. I am currently enrolled in the American Military University pursuing a post bachelor’s certificate in Civil War studies. I chose Eugene Carr after much research to find the individual who in my opinion was the most successful in his life: West Point, Medal of Honor recipient, and retired as a Brigadier General, a distinguished and honorable life’s resume for anyone.